The Price Is Riot- FAKE TRUMP PROTESTORS! | Public Advocate of the U.S. The Price Is Riot- FAKE TRUMP PROTESTORS! No wonder there are so many anti-Trump protests. Apparently, there's good money to be made in joining them! Barely a week after his election, Donald Trump is already creating jobs. Thanks to Planned Parenthood Action, Americans can make a good living joining their phony demonstrations against the president-elect. 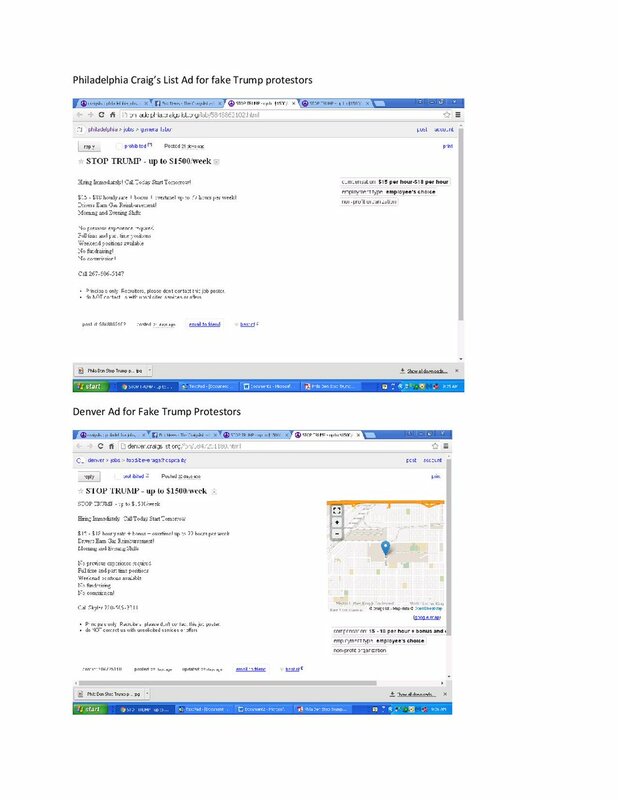 Craigslist ads like "STOP TRUMP -- up to $1,500/week. Hiring immediately. Call today, start tomorrow! $15-18 hourly rate + bonus + overtime, up to 77 hours per week!" have been running in major cities like Denver and Philadelphia for weeks. Clearly, the end of the election has only been the beginning of another phase of manufactured outrage. "I wouldn't be shocked that this group is going the extra mile to undermine the legitimate transfer of power," said former senator Scott Brown, who watched the marches sweep through his own city of Boston. "It comes to question whether they are using taxpayer money appropriately or even legally. This goes above and beyond their duty and ability to provide services for women." In the meantime, talk about an embarrassing display of the Left's crumbling support. Cecile Richards's group is so desperate for "followers" that it has to invent some. The Craigslist ads are exposing this movement for the mirage it is. This is exactly the kind of deceptiveness that we've come to expect from the Left. In this just-finished election Americans had a front-row seat to the dirty tricks liberals were using to disrupt Trump rallies -- and worse, cheat the system. Thanks to undercover videos by James O'Keefe, voters learned that liberals were even willing to pay the "mentally ill" to disrupt Trump rallies in many cases with the full knowledge of the DNC and Clinton campaign. A report by Fox News, based on arrest records of those arrested during a demonstration against Trump in Portland, showed that less than half voted. Something isn't right when people will go to the trouble of protesting-and even getting arrested-but they won't exercise their most basic and fundamental right as a citizen to vote. The bottom line: don't allow the manufactured outrage of the Left to mislead you into thinking that this effort is anything more than a vocal, well-funded minority.